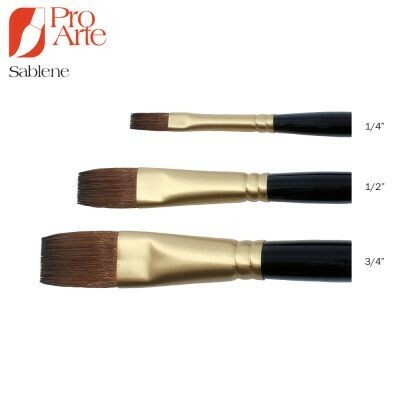 Pro Arte Sablene One Stroke Brushes offer a completely synthetic alternative to a natural sable brush. This brush range marks a new leap in synthetic technology that will meet the expectations of sable purists and offers a great brush for artists looking for a cruelty-free alternative. This One Stroke brush has a flat profile which makes it excellent for creating large washes or bold strokes of colour. It’s edge can also me used for more detailed work. They have polished black handles and beautifully finished gold colour ferrules. The Prolene range was Pro Arte’s first groundbreaking synthetic, capable of matching the pointing capabilities and spring of a natural hair brush. However, the colour carrying capacity of sable was a property that this synthetic could not match. New developments in synthetic technology have resulted in hair that mimics the twists, turns and scales of natural hair - these hairs are graded and blended carefully to form the Sablene brush range.